The Motion Coordinator MC464 represents a quantum leap in motion control technology. Run your machine faster with this Motion Coordinator based on the 64 bit 400MHz MIPS processor. 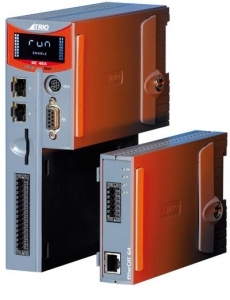 Choose the motor and drives to best suit your application without compromise, MC464 provides interface options for traditional servo, stepper and piezo control together with many digital interfaces for current digital servo drives. Increase the flexibility of your equipment with support for up to 64 axes of motion control. Trio’s tradition of modular configuration has evolved into convenient clip-on modules allowing the system designer to precisely build the configuration needed for the job.